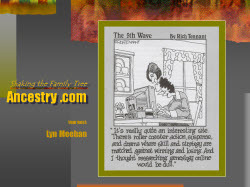 "Shaking the Family Tree: Ancestry.com"
Databases of all types have unlocked new avenues to primary source documents, images and a variety of genealogical research aids the world over to the twenty-first century family enthusiast. Searches with turbo-boost power are returning accelerated results with a higher success rate. It beats finger scrolling and paper cuts through archaic card catalogues, but databases are not infallible to erroneous information. Wouldn’t it be foolish to trust electronic resources assuming your ancestors are not in the original records just because they don’t amazingly appear in your initial searches?